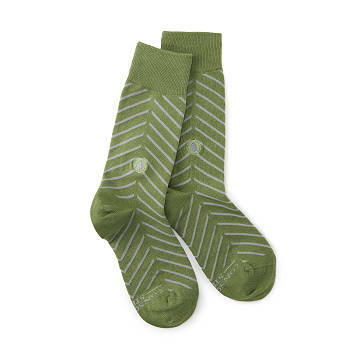 Help plant trees and foster more healthy, happy communities with these special socks. Let's get right to the root of it: more trees = better lives. That's why these subtly arboreal socks (i.e. featuring a beautiful shade of green and small tree symbol) were made. Each pair benefits the Trees for the Future organization, which works with 3,000 farming families across Sub-Saharan Africa to implement forest gardening programs—that means more nutritious food, sustainable practices that lessen the burden on women and children, and decreased pressure on forests since the families are more self-sufficient. Go ahead, get a pair of these and plant the seed for change. Made ethically in India with organic cotton.